Morning sunshine!! The sun woke me up again after I switched off my alarm. That means it's really time for breakfast! 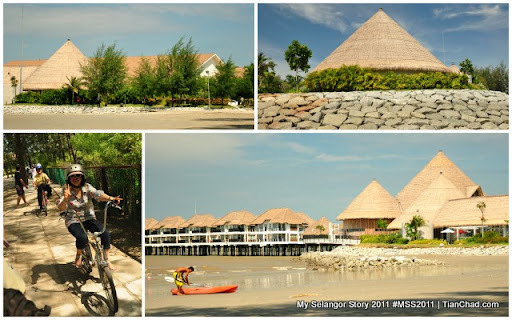 I was staying in Golden Palm Tree Resort and Spa's Canary Palm Villa that can fit 4 or more people. The bed is really comfortable that you don't feel like want to wake up so early. 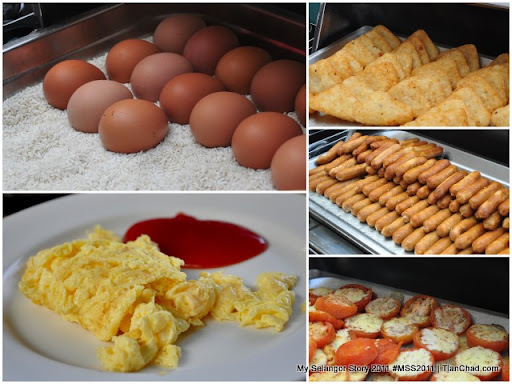 I wish I can sleep longer but it's time to have my breakfast before the water sports & beach activities at Smiley Beach. This is the infinity pool located at the heart of Golden Palm Tree Resort and Spa. Morning swim is always good for health =) At night, the colourful lights at the bottom of the swimming pool will illuminate the pool and makes it quietly beautiful. Remember to swim or at least take photo in front of the infinity pool along with the beautiful scenery. After breakfast we heading to Smiley beach, thanks to the Buggy Service that fetch us to the lobby! Between this is Suzan. She is always with her camcorder =) Watched her video and found out she is almost like a professional reporter. 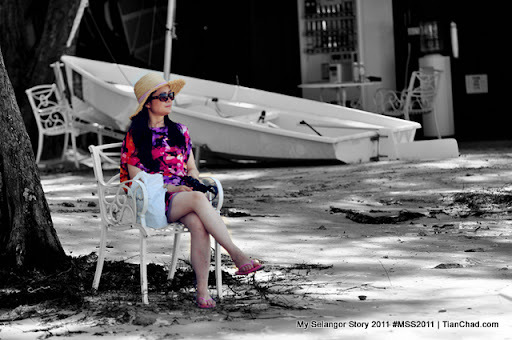 After we reach Smiley Beach, Pamela keep saying, "I need to go to the water now!". Hence there she go running towards the sea!! She was really excited to play the windsurfing. 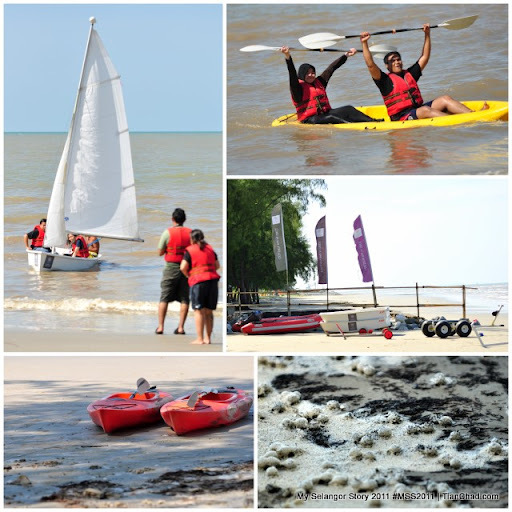 Besides windsurfing, you can also play kayaking, speed sailing, cart sailing, optimist and many more. I wanna play Land Sailing but it doesn't looks like available during high tide. One more photo by Nigel. I like his's clear bokeh photo. Here's the view of Golden Palm Tree and Sepoi-Sepoi. 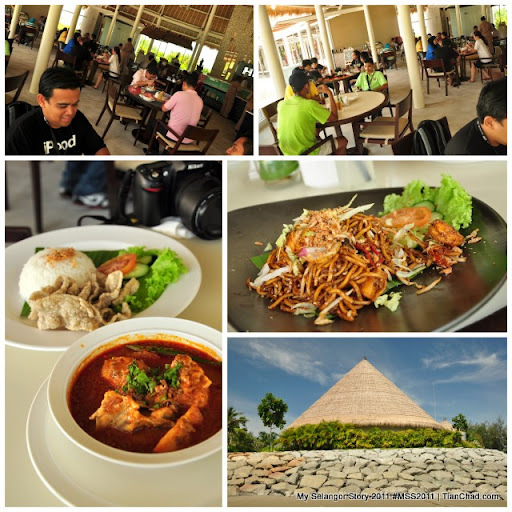 We went to Sepoi-Sepoi for lunch before our 20 minutes cycling trip. 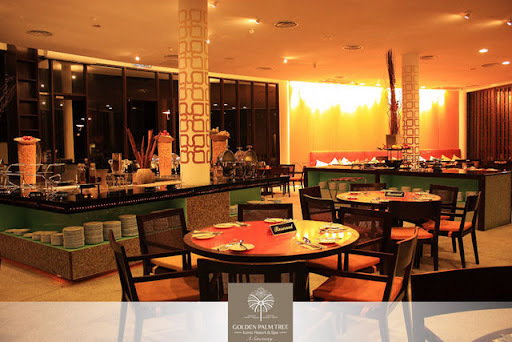 Good to know that Golden Palm Tree practice 3R (Reduce, Reuse, Recycle) and for your information Golden Palm Tree Resort and Spa is a green company that undergo environmental friendly practice. Even the brochure and folder are made of recycled paper. That's the recycle corner at the beach side. We all went back to our respective room to clean ourselves after the water sport. 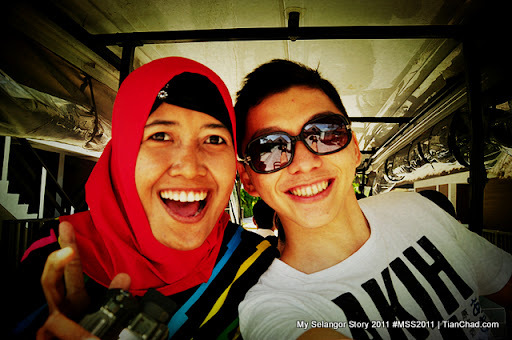 Noticed Suzan like to wear colourful shirt =) Thanks buggy again for sending us!! The driver is always kind and greet us every time we take a ride. One of the beautiful couple spotted while I was on the buggy. The girl fling her hair and the guy just get amazed lol. Something drawn my attention when I saw her coloring her batik art piece. That's Henna tattoos on her shoulder. One of the safe way to have beautiful and temporary tattoos on your body. This arts is called Mehndi (Mehandi). You can usually see these on Indian's wedding ceremony. The Mehndi art is ranging from RM20- RM55 depends on the amount of Henna tattoos. After bath we went to Sepoi-Sepoi again for lunch. Do you like the cone-like alang-alang rooftop? Low tide at Golden Palm Tree in the afternoon. There are tons of 'Geramak' @ Solder Crabs digging out from the sand!! We are going to explore the Low Tide Kingdom after the cycling trip. 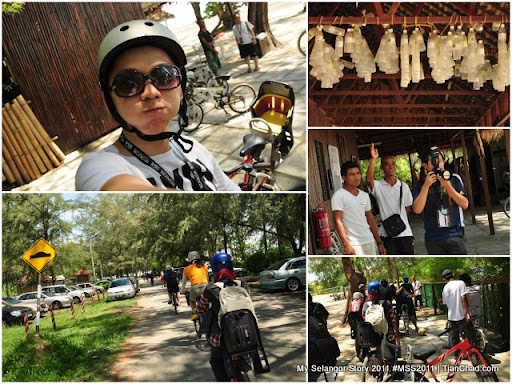 After lunch and a short break, we went back to Smiley beach for the cycling activity. We were cycling around the town and the sun was really hot!! O.O That's how I got sunburn on my neck. 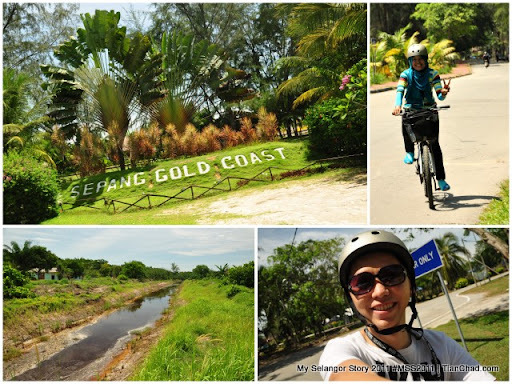 One of the bicycle already emitting noise and that indicate maintenance time ~ Maybe because cycling tour is one of the most popular activity in Golden Palm Tree till GPT crews didn't have much time to lubricate it. Do make sure your brake is working before go on tour ya. Wonder where were we and what we did? 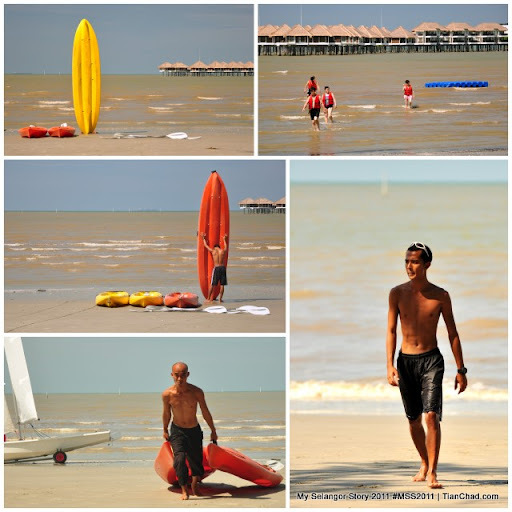 Stay tune on my upcoming blog post on Low Tide Tour @ Golden Palm Tree! PS: some of the photos above was taken using Nikon AF-S VR-NIKKOR 70-200mm 1:2.8G Zoom Lens. It is useful to capture people who are playing in the middle of the sea.